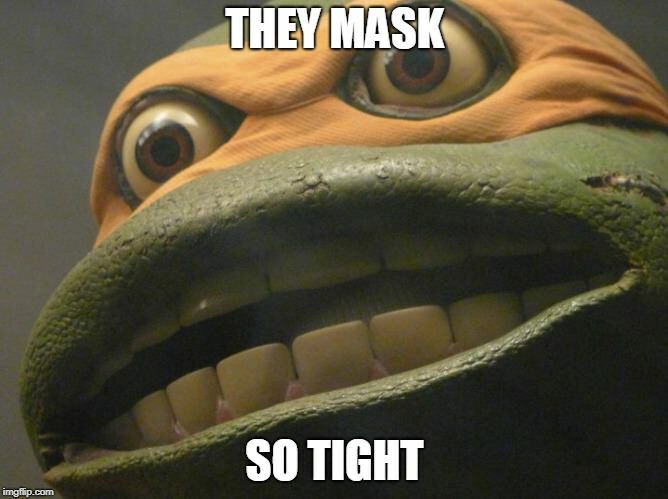 Are we even sure that "Masks" COULD have influenced TMNT 3? It came out less than a year before TMNT 3 came out... surely it would have already been filming about the time the second issue of it dropped, or already written for sure. "How's this for an opening (or closing) scene for the second TMNT movie (maybe run under the credits): A garbage truck rumbles past the camera, heading for the landfill. It stops at the edge of a hill of refuse. The two sanitation engineers get out of the truck, and go around back to make sure the truck makes its dump properly. As the trash spills out, one of the guys sees something metallic glinting in the mess, and pulls it out. He holds it up, and in a medium closeup we see that it's the Shredder's helmet, crushed and twisted. We [Kevin Eastman and I] both feel that the Shredder should not appear in the second TNT movie, but this might be a subtle enough way to refer to his ambiguous fate and set the scene for his appearance in a third TMNT movie (if that happens). . . .
(Note that this sets up a scenario in which the "Return to New York" story [as told by us in issues 19, 20 and 21 of TMNT] could be the basis of a third movie, involving the return and ultimate fate of the Shredder, and the mutated Triceraton's team-up with the Turtles to invade the Shredder's domain." "I may have notes somewhere about this, but at this point I don't remember a lot. However, I seem to recall that the time-traveling to feudal Japan thing came up early in discussions, and was something we were all intrigued by." "As far as I know, it was not. My understanding was that the script for that movie was created from the ground up, not from pre-existing material. However, there may be things I am not aware of regarding that." "I seem to recall that it turned out -- in large part -- pretty close to what we were expecting, but with a few things which made it seem sillier on screen than it did on paper." I don't know, I never really thought about it and wasn't cognizant of the time spacing. I guess it's one of those things that I just saw people say so much that I never really bothered questioning it. Honestly, outside of time scepter travel to Japan, it really does seem more Distractions than Masks. I haven't read the latter in a while, though. Yes, it means EXACTLY what I think it means. I’ve seen people in Gargoyles fanfiction compair the Gargs to the Turtles. This normally happens in self insert fics where the author of the piece inserts themselves as characters in their own fic and encounter the Manhattan Clan. When that happens it one of two things occur. The first is the Self insert character knowing the Gargoyles Clan on sight and saying “Oh yeah there is actually a cartoon about you guys” or they are compaired to the Ninja Turtles or both. Both groups consist of all Males, there is a wise master type and four younger ones. A female friend who fights along side them and is at times used to bait them out. Another male friend who also becomes part of the group. And like later versions of the Turtles there is a female member of the team added, and evil clones of the main characters. Both groups have had people whose lives have been greatly and unfortunately altered either directly or indirectly because of the main characters so they blame everything that happened to them on group inquestion. Both groups have encountered villains that want to hurt them or the world around them because it gives them a sense of retribution. While in reality they are only authoring their own misery. Friends who become enemies and vice verse. Other villains who seek to use them for their own ends. And villains who seek to kill them just because they exist. Also both groups live in New York. And in the case of Bronx, Cagney, and Klunk/Ice Cream Kitty, Spike, and Chompy both groups have pets of some sort. I believe Greg Weisman also was aware of the comparison between the Gargoyles and TMNT so he said something about the Gargs liking any sort of food except Pizza. Personality wise I guess you can say Splinter and Hudson could relate since they are the old masters. They occasionally come on battles but most of the time sit in their respective lairs and watch TV or bits of wisdom. Leonardo can be comparible to Goliath. As they both are leaders of their respective groups and do have a high value in honor towards ones family and the world around them. But I feel Goliath may find that Leo still does have a lot to learn about being a leader in some cases. Mainly because Leo is still young and at times pushes his beliefs on his brothers which causes them to not take his leadership seriously. Where as Goliath is older (He’s roughly in his 30/40’s in human years and was in his late teens to twenties when he was first appointed as leader.) and from another time. Brooklyn I guess he could be comparible to Raph as they are both are wise cracking hot heads of their respective groups. And they have a think for motor I’d say that Brooklyn is closer to Leonardo in that he is placed in a position that he feels honored to be in. But he doubts how effective he actually is as a leader when he is actually in a leadership role after Goliath, Bronx, and Elisa disappear. Much like how Leo does occasionally doubt himself as a leader. Broadway is close to Mikey in that they are the Chefs of their families. Broadway isn’t obsessed with food to the same extent Mikey is with Pizza. But both do have a well meaning hearts and are less narrow minded then their companions about some things. Lexington would is kinda like Donatello in that they are both the tech wizards of the group. And the others do depend on them both to bypass security or come up with solutions to problems with electronics. Though Lexington isn’t really a genius in the same way that Donnie is. Lex is also the youngest member of the Gargoyles and as such has his moments where he isn’t taken seriously by his rookery brothers. So that could be something he can sympathize with Mikey. But his youth does make him rather nieve (After all New Friend Old Enemy was almost a beat for beat copy of Thrill of the Hunt) though unlike Mikey he does let his grudges against people get to him. I still want Stockman and Xanatos to briefly team up, only to back stab each other. Because that's how they roll. Also Demona and Krang or Ch'rell depending on the version, but that would probably go even uglier. Leatherhead really, really depends on the version, but I guess the closest parallel might be Macbeth. And THAT would be quite a ride. Maybe Sevarius and Stockman joining forces. Demona may join forces with the Shredder, but only so she can get her hands on utrom/Kraang tech. And Shredder may use her for her gifts in magic. But both intend to kill one another once they no longer serve a purpose. Xanatos I see working more with Bishop, but it depends more on what point in the story. After all Xanatos only brought the Gargoyles back to see if the spell worked and then he wanted them as his personal army. When they rebelled he built the steal clan to replace them. Then after the gargoyles left the castle for the clock tower, Xanatos didn’t really want to destroy the gargoyles. Yes, he would try to kill them because they got in his way of his desires for immortatlity. But more often then not he used them for his own purposes. Bishop was the same way in that he was willing to sacrifice the Turtles in his desires to protect the earth from alien threats. But he is more open to using them for his purposes then openly destroying them. And then later in the future he sort of feels he owes the Turtles as an apology for all he has done to them. Leatherhead is hard to say. I mean yeah I can see Macbeth in that Macbeth is only enemies with the Gargoyles since he is after Demona because he can’t die unless the two of them die at each others hands. But later realizes the Gargoyle’s aren’t his foes and that he is better off helping them. 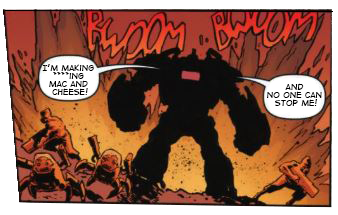 I’d say Leatherhead is more like the mutates. Leatherhead in the FW version isn’t really a bad guy, but he isn’t good either. The only side he’s really on is his own side. the 4Kids version is an intellectual like Donnie, but he was raised by the Utroms. When the Utroms left he felt abandoned by his family. Then when he met the Turtles he felt he had people he could trust and see as a family again, unfortunately he had already met Stockman who tells him that the Turtles are the people who made the Utroms go away. This causes him to feel betrayed and he attacks the Turtles until Stockman mistakenly admits he is associated with the Shredder. Then at some point Leatherhead is found by Bishop and tortured simply because he is a mutant and because of this he goes into fugue states where he blindly attacks anyone around him. Nick Leatherhead was mutated and tortured by the Kraang, as such he goes into Fugue states that make him too dangerous to have in the lair. But later learns to control his anger as he gains companionship with the other Mutanimals. Talon was originally Elisa Maza’s younger brother Derek . At first he is aware of the Gargoyles thanks to Xanatos. He’s not their friend yet, but he still doesn’t take Elisa’s warnings that Xanatos is evil incarnate seriously. He is then given a syrum that will make him into a mutant panther/bat thing. The gargoyles attack to rescue one of the mutates Maggy Reed, later named Maggy the Cat because Brooklyn got a crush on her. During the rescue Goliath allegidly kills Savarius on accident. Derek blames the gargoyles for his mutation because Savarius was the only person who could cure it. Because of his mutation he takes on the sobriquet of Talon. Later he learns Savarius’s death was faked and that the Gargoyles weren’t his enemy. Because of this he gathers his fellow mutates and create their own clan down in an abandoned subway. Fang is similar to Slash in that he uses his new mutant form to bully and show dominance towards the people in the labyrinth. He is defeated and imprisioned. He later teams up with Damona and Thalog but is defeated again though he does appear again in a SLG Comic called Bad Guys-redemption. In this comic he is part of a group of former villains called the Redemption Squad. Much like Slash used his new mutant form to attack and attempt to kill Raph’s brothers so Raph wouldn’t be hindered by them anymore. Raph at first likes the idea of Slash as a mutate, but when he realizes that his former pet intends to harm his brothers Raph turns against him. Later Slash joins forces with the Nutralizer against the Kraang but then realizes that he didn’t intend to destroy just the Kraang. Later he joins forces with the Mutanimals as a redemption squad of his own. Much like the Gargoyles and Labyrinth Clan (the Mutates and the clones of the Manhattan clan) The Turtles and Mutanimals are aware and tollerent of each other. But don’t really go out of their way to associate with one another. Last edited by victory_angel; 04-28-2018 at 11:20 PM. I want an actual robot Mouser that just walks around the house and doesn't leave holes in my walls. Way back when the first Nick animated series was announced, 2011 or 2012, I remember reading something (that I think was a news source, as opposed to a blog) that said Donatello would have a pet Mouser named Mickey. I was really excited by the idea of it, that Donnie re-programmed one of Baxter's havoc-wreaking robots into a little buddy. I imagined him assisting Donnie in the lab, & behaving puppy-like around the lair. It never came to be & I always wondered why it was scrapped. I can find no proof that this concept ever existed outside of my own brain, which leads me to wonder if I didn't just dream it up or something. If so, I totally need to make a fan-comic out of it, 'cause I still love the idea. Program them to also help pick up around the place and I'm in. How old do the Fred Wolf fans have to get before nobody cares about that show anymore? Most of them are pushing 40 now. It's weird that an arguable majority of the TMNT fanbase still cling to an old toy commercial. I don't think there's any Justice League fans still proclaiming their love of Superfriends above all other versions. Older DBZ fans also still rave about DBZ, for example. Superfriends wasn't marketed that much. It debuted in 1973, and between 1946-1973 the rules for advertising toys to children with animated TV series were strict even in the USA (but not as strict as in Sweden). I've seen fans of the show of all ages. From kids who were introduced to tmnt by the Nick series and saw the 80s show online to 40+ year old adults who only have vague yet fond memories of it. I don't think its fans will die out anytime soon due to the aftermath of turtlemania still being felt today and the easy ways to access the show online (not anymore on Youtube, but at one point, I remember certain season 3 episodes having millions of views). I'm pretty sure that Superfriends also has a sizable number of fans today. Leonardo: ... and who doesn't love my one-liner?! They fire up the team, right guys?! These are not grammatically correct lines. I wonder who was responsible for this. Batman: The 1960's Batman Adam West show and then Batman:TAS, despite both being old as hell now they overshadow everything else. Power Rangers: The first series in the U.S.
Star Wars: The orginal Star Wars trilogy. Look at the hate the prequels or new movies get. I mean this is just how it is. Any popular long lasting franchise that goes on for generations, whatever the first or biggest iteration was will overshadow everything else. I don't like it either but that's just how it is. For TMNT, the original cartoon just has more public eye than the Mirage comics and then the next 3 cartoons. Yeah but nobody's really calling the JLA "Super Friends" anymore, you know? I'm sure if you look hard enough, you'll find some guy who thinks "Fred and Barney meet the Thing" to be the greatest Marvel cartoon of all time, it's just not typical. It's really just a question of time and momentary popularity. As far as I can tell, most fans of the Fred Wolf cartoon are still the 33-40 year olds who grew up with it. Anyone else seem to be a minority consisting of their kids and people randomly deciding to watch it. That's not really the weird part, it's that new fans brought in by other stuff don't seem as vocal. Either the TMNT fanbase mostly consists quiet people who aren't active on forums, or it really is mostly of middle aged men talking about how awesome their childhood fad was. It's really odd that most haven't moved on to Mirage or IDW, like how kids start by watching Spider-Man cartoons but move onto Spider-Man comics if they're still fans when they're older. Except that's not really true either. Adam West Batman is largely regarded as a joke, Batman TAS can't really be seen as the "first" in any capicity and Dragon Ball Super just ended this year. And if being "the first" grants something some magic pop culture status, how come it's not true for the Batman film serials? Or the original Wizard of Oz movie? Or the Nicholas Hammond Spider-Man movie? There's probably a lot of other examples out there. Last edited by neatoman; 04-29-2018 at 02:28 PM. How about the 1989 Batman film? Batman 66 wasn't regarded as a joke until the dark grim'n gritty revival of Batman, before that Adam West's potrayal defined what Batman was. How can any of the Turtles espessally Mikey eat as much pizza as they do without getting type 2 diabeaties. I mean we occasionally see them eat other things, but most of the time it’s pizza or pizza equivalents. If the Turtles had any foods that they enjoy eating that isn’t pizza what would it be? Lunch: Largest meal of the day for him so maybe Eggs in a Basket (Toast with a fried egg cooked in the center) A side of bacon or sausage and fruit. Donnie: Not someone you want in the kitchen. Not because he can’t follow a recipe properly. More because he can get distracted by whatever he is working on and by the time he remembers what is on the stove or in the oven it’s already a charred mess or has nearly set the lair on fire. Lunch: Sandwich-something that is east to fix and he can take it to the lab with him. Dinner: Cockpot meal- Something that Donnie could put together in the morning and just leave alone. Then by the time he’s ready for dinner its ready to serve up. Breakfast: Cereal, slightly runny scrambled eggs, toast, juice.